When a six week baby’s windpipe collapsed, blocking airflow to his lungs, doctors at the University of Michigan decided to try a new technique using 3d printing to save his life. Glenn Green, M.D. scanned the baby’s windpipe with a CT scan, generating a 3d model from the scan. With the help of another doctor, the two designed a custom fit tracheal splint that could hold open the collapsed airway. The custom splint was 3d printed with a biopolymer called polycaprolactone, which absorbs slowly into the body. The doctors sewed the splint around the baby’s airway, where it provided the structure the baby’s lung needed. Almost immediately the baby began breathing normally, and has been healthy for the year since the procedure. 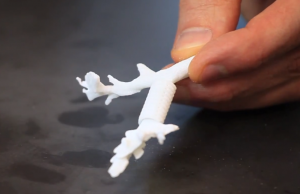 The doctors hope the scan-based design and 3d printing with biomaterials can be adapted to many other problem areas. They’ve already used it to build ear, nose, and bone structures in experimental models to show that the technique can help benefit other patients with similar issues. © 2019 3d Printing Era.